(Nanowerk News) Chemists at the University of Alabama at Birmingham have designed triple-threat cancer-fighting polymer capsules that bring the promise of guided drug delivery closer to preclinical testing. These multilayer capsules show three traits that have been difficult to achieve in a single entity. They have good imaging contrast that allows detection with low-power ultrasound, they can stably and efficiently encapsulate the cancer drug doxorubicin, and both a low- and higher-power dose of ultrasound can trigger the release of that cargo. These three features create a guided drug delivery system to target solid tumors. Therapeutic efficacy can be further improved through surface modifications to boost targeting capabilities. 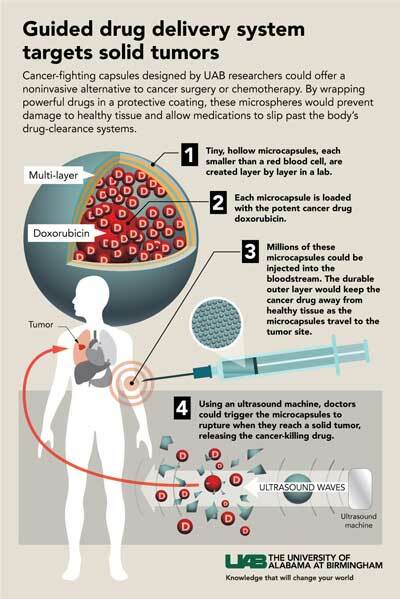 Diagnostic low-power ultrasound then could visualize the nanocapsules as they concentrated in a tumor, and therapeutic higher-dose ultrasound would release the drug at ground zero, sparing the rest of the body from dose-limiting toxicity. This precise control of when and where doxorubicin or other cancer drugs are released could offer a noninvasive alternative to cancer surgery or systemic chemotherapy, the UAB researchers report in the journal ACS Nano ("Theranostic Multilayer Capsules for Ultrasound Imaging and Guided Drug Delivery"). "We envision an entirely different approach to treating solid human tumors of numerous pathologic subtypes, including common metastatic malignancies such as breast, melanoma, colon, prostate and lung, utilizing these capsules as a delivery platform," said Eugenia Kharlampieva, Ph.D., an associate professor in the Department of Chemistry, UAB College of Arts and Sciences. "These capsules can protect encapsulated therapeutics from degradation or clearance prior to reaching the target and have ultrasound contrast as a means of visualizing the drug release. They can release their encapsulated drug cargo in specific locations via externally applied ultrasound exposure." Kharlampieva -- who creates her novel "smart" particles while working at the intersection of polymer chemistry, nanotechnology and biomedical science -- says there is an urgent, and so far unmet, need for such an easily fabricated, guided drug delivery system. The UAB researchers, led by Kharlampieva and co-first authors Jun Chen and Sithira Ratnayaka, use alternating layers of biocompatible tannic acid and poly(N-vinylpyrrolidone), or TA/PVPON, to build their microcarriers. The layers are formed around a sacrificial core of solid silica or porous calcium carbonate that is dissolved after the layers are complete. By varying the number of layers, the molecular weight of PVPON or the ratio of shell thickness to capsule diameter, the researchers were able to alter the physical traits of the capsules and their sensitivity to diagnostic ultrasound, at power levels below the FDA maximum for clinical imaging and diagnosis. For example, one-fourth of empty microcapsules made with four layers of TA/low-molecular weight PVPON were ruptured by three minutes of ultrasound, while capsules made of 15 layers of TA/low-molecular weight PVPON or capsules made from four layers of TA/high-molecular weight PVPON showed no rupture. The ruptured capsules had a lower mechanical rigidity that made them more sensitive to ultrasound pressure changes. Experiments showed that the ratio of the thickness of the capsule wall to the diameter of the capsule is a key variable for sensitivity to rupture. To test the ultrasound imaging contrast of the microcapsules, the UAB researchers made capsules that were 5 micrometers wide, or about two times wider than the capsules used in the rupture experiments. This size is small enough to still pass through capillaries in the lung, while a larger size for various microparticles is known to greatly improve ultrasound contrast. Red blood cells, for a size comparison, have a diameter of about 6 to 8 micrometers. Researchers found that 5-micrometer-wide, empty capsules that were made with eight layers of TA/low-molecular weight PVPON showed an ultrasound contrast comparable to the commercially available microsphere contrast agent Definity. When the UAB capsules -- which have a shell thickness of about 50 nanometers -- were loaded with doxorubicin, the ultrasound imaging contrast increased two- to eightfold compared to empty capsules, depending on the mode of ultrasound imaging used. These doxorubicin-loaded capsules were highly stable, with no change in ultrasound imaging contrast after six months of storage. Exposure to serum, known to deposit proteins on various microparticles, did not extinguish the ultrasound imaging contrast of the TA/PVPON microcapsules. A therapeutic dose of ultrasound was able to rupture 50 percent of the 5-micrometer, doxorubicin-loaded microcapsules, releasing enough doxorubicin to induce 97 percent cytotoxicity in human breast adenocarcinoma cells in culture. Adenocarcinoma cells that were incubated with intact doxorubicin-loaded microcapsules remained viable. Thus, Kharlampieva says, these TA/PVPON capsules have strong potential as "theranostic" agents for efficient cancer therapy in conjunction with ultrasound. The term theranostic refers to nanoparticles or microcapsules that can double as diagnostic imaging agents and as therapeutic drug-delivery carriers. The next important preclinical step, Kharlampieva says, in collaboration with Mark Bolding, Ph.D., assistant professor in the UAB Department of Radiology, and Jason Warram, Ph.D., assistant professor in the UAB Department of Otolaryngology, will be studies in animal models to explore how long the UAB capsules persist in blood circulation and where they distribute in the body.